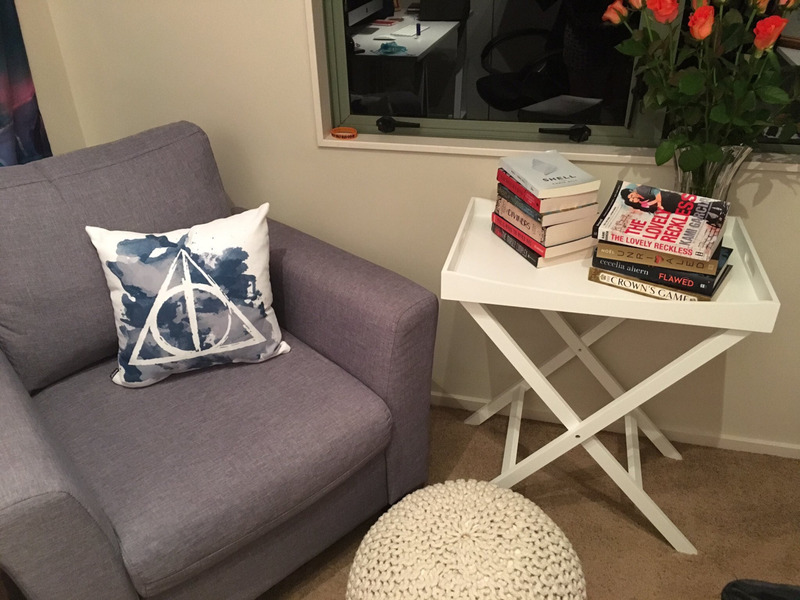 Bookworm Boutique: Tag: Reading Habits! Recently I decided it'd be fun to participate in some bookish tags, I really haven't done many (if any) of them on this blog but I'm going to start now! Because I haven't been actually tagged in tag posts, I had a look on the internet and found a couple of ideas. After asking my Twitter followers what they'd be most interested in, this post was born! I originally found the tag on Dreamland Book Blog's page, but the tag was created by YouTuber TheBookJazz -- here goes! *Prepare for shockingly bad GIF use. I do! I have an armchair and footrest in my office that's incredibly cosy, I'll insert a photo below. The pillow is from my wonderful friend Lauren's (FictionTea's) Society6 store. I also have a blanket from Disney World and has Mickey and Minnie Mouse sitting on a bench with Cinderella's castle behind the that sits on the back of my armchair making it even more warm and lovely to read in. Ps. I realise that the GIF below has a spelling error, but it was too good not to use! I can definitely drink while reading, usually tea or water, but I cannot read. I end up with crumbs everywhere or laughing at something with food in my mouth, it's just not a ladylike combination. I try to stay away from books + food whenever I can. I'm one of those absolutely annoying people who must have complete silence while reading (sorry if you're also one of those people and I just called you annoying, you're not annoying, it's just me), I'm honestly so easily distracted. I can get away with listening to a film score while writing a blog post or reading something that's not too intense, but if there's words to the song or people speaking I have to stop reading or I won't take in any information. I really envy people who can read while watching TV! I used to be a person who could only read one story at a time, but this year I've started picking up and putting down books more often. I like that if something you something horrible has happened in the book you're reading, you can put it down and read something happy for a while instead, and then go back to whatever it was you were reading first! I think that audio books really got me into reading different books at once. It does make travelling difficult, though, you end up with so many different book choices! I take a book with me everywhere, plus an eBook, plus an audio book... I can't read in a car, I get severe motion sickness, so I always have audiobooks. Whenever I'm stuck waiting for someone or don't know what to do with a few hours I have spare I'll find a local library or a park and just sit and read to pass the time, but I do prefer reading in my own home because... pajamas. I hate to admit this but sometimes I'll skim long paragraphs if the author has been describing the same tree for a page and a half, I read down the middle of the page and get most of the information but will definitely half-skip sections (I don't do this often, maybe one book per 20 that I read, it usually happens if I don't enjoy the author's writing style). I once, and I mean once, looked to the end of a book. I had never done it before but I was so wrapped up in a certain world that I just had to look and check to see if everything turns out okay, I was sO ASHAMED of myself! I totally spoiled it, haha! Personally, I like keeping books brand new. I don't like to break the spine or dog-ear pages and I believe that if a book has been loaned to you that it should be returned in the same state as when you got it. That being said, I love how books with broken spines look and how their pages fan out. All my Harry Potter books have broken spines because I read them so young, and they sit so beautifully on my shelves. A novel? No. Plays and poetry books? Yes. I absolutely love writing in the margins of plays and poetry books, I think there's so much inbetween the lines (plus I took drama all through school and the theory part was my favourite so it's a hard habit to shake!) My copy of A Streetcar Named Desire is packed to the brim with notes and highlights and it's one of my all time favourite books. I won't be writing in my copy of Harry Potter and the Cursed Child, though. I love the idea of those book exchanges, though, the ones where one book is sent to a bunch of different people and at the end you have a book with lots of different people's thoughts and feelings scribbled in, it sounds like a great idea and would be something that I would cherish. That's it, guys! (Sorry, I couldn't go an entire post with gifs and not use one of Ariel...) I hope you enjoyed this post and that I get tagged in some different ones so I can do this again. Let me know in the comments if you have any quirky reading habits, I love to hear from you all! Okay that book exchange where everyone makes notes of their thoughts and feelings sounds kinda cool!